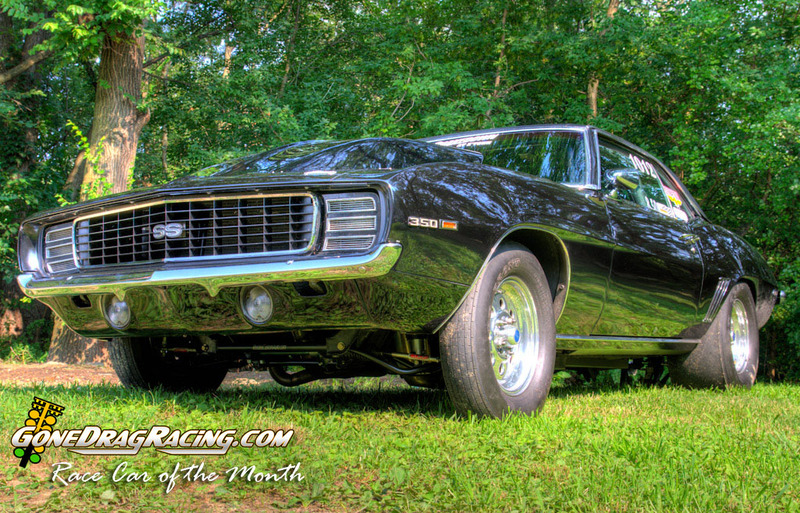 August 2009's Race Car of the Month belongs to Sue and Bill Verzilli, a beautiful '69 Camaro. Bill, Sue, and their two children live in Mt. Ephraim, NJ, not too far from Atco but also close enough to make them regular racers at the other drag strips that surround us in the Northeast. You will find Bill racing the popular 8.50 Index Circuit, along with their helpful crew member Billy Jr, taking care of the car in between rounds along with his mom Sue. The Verzilli family ranks at a 10 on my friendly scale. The entire crew is always smiling whenever they are at the drag strip, whether it is going rounds during an 8.50 Index race, walking around the staging lanes, or sitting in the stands watching the action. They make racing a family affair, and include everyone else from the racing community in their family (ok, maybe except for about 8.5 seconds when the tree drops). As you have seen from past races and photos, the car leaves pretty darn hard! Bill said that it used to leave a lot harder, and they added the wheelie bars because they were tired of breaking things when the car came down for a landing. Bill has been racing for over 30 years, which has given him plenty of seat time to go rounds with the best of the best, evident with his performance at last year's 2009 Shakedown @ E-town, where Bill went to the Semi Finals last year, against a tough 32 car field that had an 8.59 bump spot. Unfortunately due to some bad luck and mechanical failure, Bill is currently sidelined while repairs are taking place, so that means you won't be seeing any results from the Fonse Performance dyno this month. They hope to be back racing as soon as possible. A: Auto Mechanic. Besides racing, we like going to the Poconos every October, day trips to Smithville & NYC, grilling & hanging out in the back yard. Football - especially watching the Eagles. GDR: What is your earliest memory of drag racing? A: Mid 70's with my 67 Tempest. 400 Pontiac motor/4 speed. GDR: What made you get into the driver's seat for the first time? A: I always liked drag racing and going fast. GDR: What is your favorite memory related to drag racing? A: Winning my first bracket race in 1990 with my 68 Camaro. GDR: Where have you raced, and where is your favorite place to take the beams and nail the throttle? A: I've raced at Atco, Maple Grove, US 13, MIR, Virginia Motorsports Park, Cecil and Englishtown. My favorite tracks to race are Atco and E-Town. 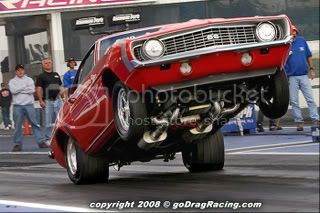 GDR: We see your son at the track all the time, how important is family combined with drag racing to you? A: It's very important. Sue & Billy play a major role in getting the car ready between rounds. They both have their jobs and get started as soon as I pull up to the trailer. It's nice being in a sport that we all love and spending time together. It makes it that much more enjoyable. GDR: What do you enjoy most about heads up racing? A: It's a challange and I like being competitive. The 8.50 class has a lot of really good drivers and friendly people with stout cars. I like that on any given night, anyone can win. You have to be on your game. GDR: How much of your time a week is spent on maintenance on the car? A: Usually two days before the race, I go over the car and check everything. GDR: If you had an unlimited budget, what would you do to the car? A: I'd make it a lot lighter and build a killer turbo charged motor for it. GDR: If you could make one change to 8.50 Index, what would it be? A: I'd like to see the MPH reflect the ET. My wife & crew chief Sue, Billy Jr., Henry Jackson Racing Engines, J & E Performance, Rossler Transmissions, Aerospace Components, Rhodes Custom Auto, Moser, Crower. Anything else you want to say to us? I like that the drag racing community is a tight knit community. If you have a problem at the track, you can get help from the people you race against. We all do what we can to help a fellow racer. And then when you get to the tree, it's all business. It's a great family sport. I couldn't do this without the help and support of my wife Sue & son Billy. (better know as J & E Performance) for their tuning, advice and fabrication. 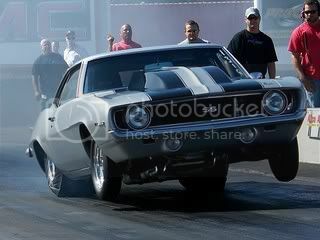 We invite you to visit the photo gallery to see more on the Verzilli Racing '69 Camaro. Very nice, congrats on getting picked for the car of the month, It could not happen to a nicer family. Well done team Verzilli racing, yes I know guys, lol. Looks like the car is a bit lighter too. Looks like all the parts are there to me?? Hmmm, no photoshopping this one ? ?, lol. Great shots BTW. The Q&A is cool also. Looks great guys! Get cracking Mark. A huge THANK-YOU to Seth for making us look good. You and Mike have brought this website SO far in 18 months. It's really nice to look forward to the coverage of the races we can't make and yet feel like we were there. Your pictures and articles just keep getting better and better. And again, Bill, Billy & I think this is quite an honor. We couldn't do this without the help and skill of J & E Performance and Henry Jackson. Working with the best of the best is definitely an advantage!! Congratulations! Very nice write-up and pics. Hope to see you all out again soon. Congratulations Bill, Susan and Billy! You guys really deserve this honor and recognition. All the hard work you put into each race is really quite commendable! It couldn't have happened to a nicer family!! 8.38 @ 161 mph. 1.20 60 ft.
Hey Susan, lil Bill got BIG, man he was a tot last time I saw him. No worries Susan on the you know what that Schank keeps reminding me about, the more I do the more I learn. Congrats Bill and Sue on your feature!!! Congrats to the Verzilli team. This is such a great way for gdr to recognize and introduce racers to other racers. I rarely get a chance to say hello as teams are always so busy on their cars. Feel like I know you all now. Congrats Bill & Sue - and great job Seth! By far one of the nicest '69's around! Hey Susan, lil Bill got BIG, man he was a tot last time I saw him. Last edited by JerzeyGirl on Mon Aug 17, 2009 6:33 pm, edited 2 times in total. Thanks everyone. Sue is right. Its really is an honor. great car and great family! My favorite car of the month so far! Congrats guys! hope to see you guys soon!